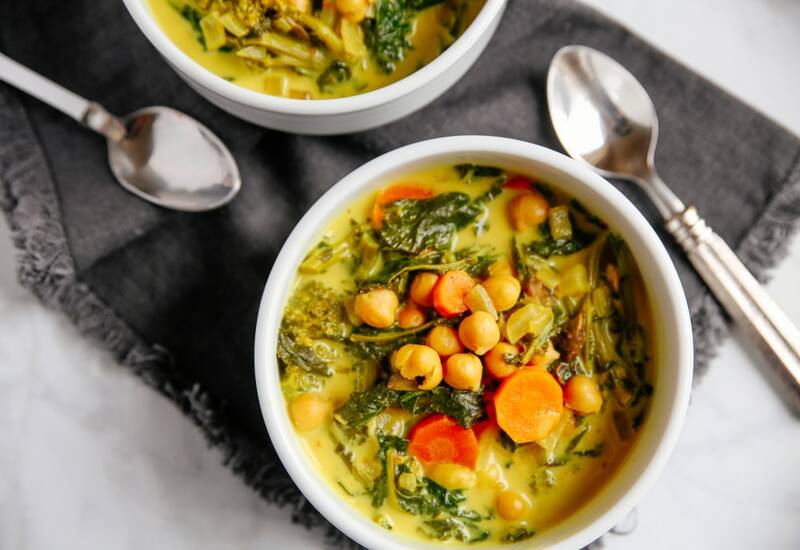 Packed with nutrient-rich vegetables and fiber-filled chickpeas, this vegan soup deserves to become a regular part of your dinner rotation. It's filled with a variety of flavors and textures, resulting in a healthy, filling dinner for cold nights. Carrots, broccoli rabe and cremini mushrooms are simmered in a savory coconut broth seasoned with aromatic turmeric, fennel seeds and star anise. It's a great recipe to feed a crowd, with inexpensive ingredients and a cooking time of only 40 minutes. It's sure to become your new favorite comfort-food recipe. You can substitute your favorite leafy greens for the broccoli rabe. Try chopped dino kale, Swiss chard or packed spinach instead. For a more filling meal, serve the soup with brown or basmati rice. Prep this warming soup on Sunday and enjoy all week long for lunch. Per Serving: 215 calories; 15g fat; 17.6g carbohydrates; 7g protein; 0mg cholesterol; 359mg sodium. I love the spice combination in this soup, but I noticed it didn't call for salt. I seasoned mine with salt throughout the cooking and felt it was necessary to bring out the full flavor of the stew. This is a new favorite comfort soup. I couldn't wait to try this soup out. I will be making this more often during the fall/winter when it gets cold. It's a good alternative to your normal chicken soup recipe.